with: Giancarlo Bianchini, Enrico Casagrande, Tommaso Maltoni , Daniela Nicolò, Cristina e Daniela Negrini, Monica Pratelli, David Zamagni. 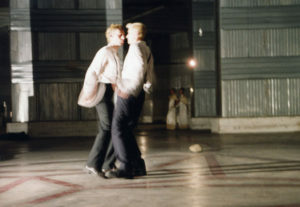 Appeared for the first time in December ’94 within the metal walls of the “Stazione Frigorifera Specializzata” (the Specialised Refrigerated Warehouse) in Verona, managed by the Cultural Association “Interzona”, which also co-produced the performance. 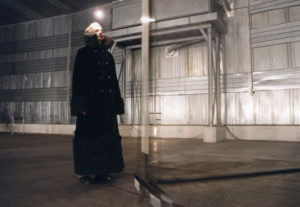 The event developed in the former refrigerated storeroom, a huge impressive place whose walls and ceiling entirely covered in aluminium become extraordinary scenery. 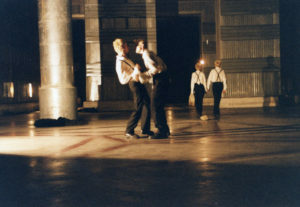 A pre-planned route led the audience a cross the place to see the various theatrical actions. 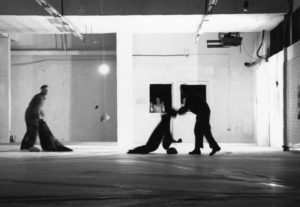 The choice is Beckett, Beckett who abandons the theatre to dedicate him to the silence of conclusive total purging of the performance in order to make it more directly significant. 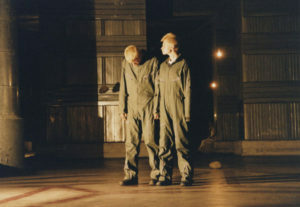 This choice is the result of a long trail of study and research via the whole literary-philosophical work, which has also seen the production of previous theatrical experiences by Motus. 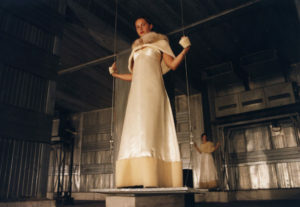 Occhio Belva goes beyond Beckett’s works as the synthesis of his works and thought: it isn’t the performance of any particular text, but an evocation of images, of waitings and suspensions taken by the whole “BIANCA” (white) production. It throws away any idea of melodrama to find its way into ” visual lyrics “. The poetic image is totally free from the word and exposed to the audience in its absolute nakedness. 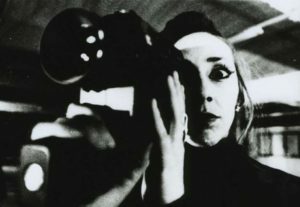 In the centre there is always the solitary body of the actor, done in the emptiness of space, always in tension, always seeking for a possible-impossible relationship with the OTHER, even if distorted, grotesque or forcedly friendly. 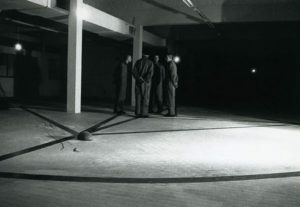 Everything is geometrically expressed by a graph on the floor, nearly an electroprinted circuit, which reveals, with ruthlessness, the routes, the cross-roads, the meeting places and battle grounds: the interminable list of victims and torturers of ” Comment c’est “. ABSTRACTION AND GEOMETRICIZATION: the routes become lines, the pauses- stops; the movements of the actors are forced into the circuit, condemned to exhaustion obliged to try every possible combination. Like a punishment, which is self-inflicted, like a sadistic childish game it reminds us of the Damned in Dante’s Purgatory, tireless walkers under the weight of the massive stones. The Beckett -type walker is reduced to the essence of movement.